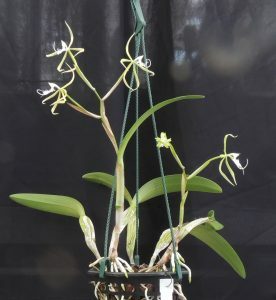 This attractive epidendrum species is found right through Central America and down through Colombia, Ecuador and Peru. Out of flower it looks very like a uni-foliate cattleya but soon shows it’s unique character when the flower spikes appear. 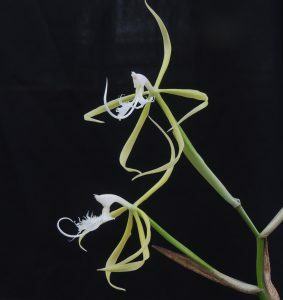 Spikes produce up to six large flowers evolved to attract a moth pollinator although it offers no reward and in common with many orchids relies on deceit pollination. Some interesting research indicates that the species produces an variety of scents presumably to aid with deceit pollination. 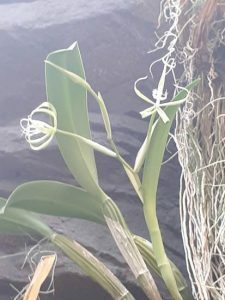 The species is found high in trees in warm forest from 500-1000m altitude and we find that the plant succeeds well mounted or in baskets of course bark where it can dry out rapidly between watering. In pots we have found it prone to rot in the new growth from being kept to wet. It also enjoys bright light. The plant here was divided 12 months ago and is growing vigorously and will be another star at the Bristol Botanic Gardens Bee and Pollination festival (though moth pollinated not bee pollinated).